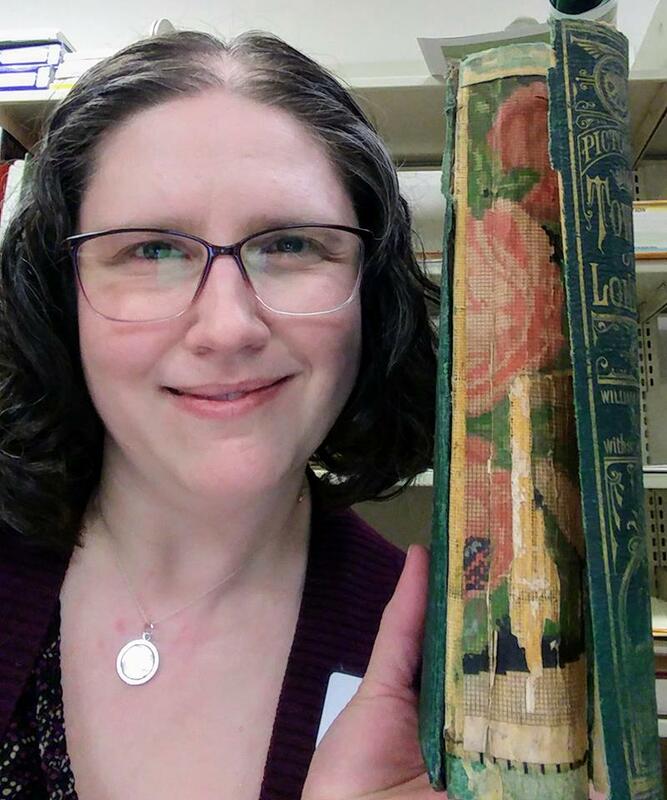 CHARLESTON, S.C. – A 140-year-old book being gently repaired behind the scenes at the Main Library got a lot of attention last week for #LibraryShelfieDay when CCPL Archivist Amada Holling posed with it. The photo we shared on social media has picked up nearly 200 likes and been seen by more than 2,500 people. The book, an 1870s copy of The Tower of London by William Harrison Ainsworth, has a torn spine that reveals underneath the hard cover a floral pattern. The uncovered pattern has not been seen since the book was bound 140 years ago by a publishing company in Philadelphia. But the exposed floral scene gave rise to several questions about the publisher, the pattern, and why it was there. Fortunately, CCPL has an archivist who can dig into the past to get some of those answers. While the process of adding a paper lining to books was not historically unique in the bookmaking process, Holling says the uncovered linings she’s seen have been printed, such as pages out of a book, and were possibly scraps from misprints or remainders. “It just so happens this one is really beautiful,” she said. The pattern looks like a modern cross-stitch, and according to Holling resembles a type of Berlin wool work that made use of aniline dyes in the 19th century because they offered bright colors and the wool did a good job of absorbing the dye. From the 1830s through the 1870s, publishers sold floral and letter patterns to make use of the new dyes. Aniline dyes give more variations in wool color which give images using them a more three-dimensional quality. Researching the use of the Berlin wool work, Holling says the embroidery style seems to have dropped off around 1880, which probably led to the paper being used as scrap in the late 1870s and during the 1880s. “If you have all this needlework pattern and it’s not selling anymore, it’s the perfect thing to use for the inside of a book because you’ll never see it, it’s decent quality, and it doesn’t really matter so it can look like anything,” Holling said. To understand how the print became visible takes knowing how books are constructed. 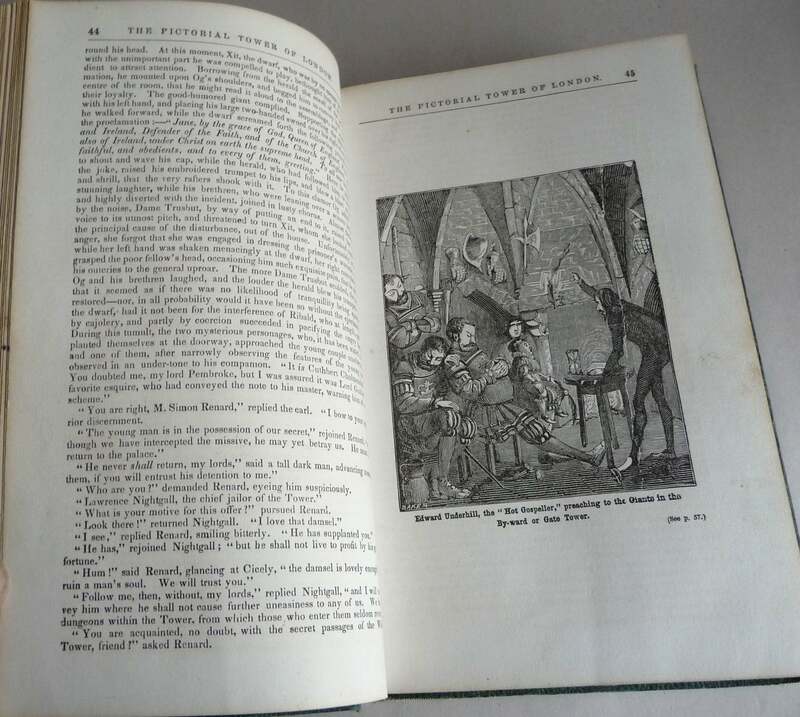 Older books, like the copy of Tower of London in our collection, follow a process. Once the pages are sewn together, a headband and tailband are sewn along the top and bottom edges of the spine to keep the pages together. After that, a cheesecloth is glued to the spine to give it structure. After that, bookmakers would cover it with a thick scrap of paper since the cheesecloth was rough and coated in glue. It would “tidy up” and protect the spine. That scrap of paper in Tower of London is the brightly colored embroidery pattern seen in the social media photos. It was an unexpected find that, had it not been for an unfortunate leak several months earlier, would probably still be hidden behind the hard cover of Ainsworth’s fictional romance about Lady Jane Grey. That leak happened in late August, destroying ceiling tiles and dumping gallons of water into the Charleston Archive and on its many book shelves. Brian Fahey and Melissa Mabry from the Catholic Diocese of Charleston's Office of Archives and Records Management volunteered their time to separate the books and start the process of drying them. Some of the books, roughly four dozen of them, were only a little damp and could be air dried. Another 18 books were so damp they had to be wrapped in plastic wrap and frozen. Tower of London was among the second set of books and was wrapped and stored in a freezer at the Main Library. Why wrap the books in plastic and store them in a freezer? Holling says freezing them stops the mold process. By the time the books were most likely ready to return to the archive for further drying and repairs, the Lowcountry was dealing with a pair of hurricanes moving along the South Carolina coast. Instead of risking further damage from a hurricane, Holling made the decision to leave the books in cold storage until the threat of tropical storms had passed. When the books came out of the freezer, CCPL archive staff looked through the damage to determine if anything couldn’t be saved, and how to handle the books that could be saved. Holling says they decided to air dry the books in batches of four, and set up a table with a pair of fans to keep the air circulating in the drying room hoping to slowly pull the moisture out of the books and return them to the collection. Working in small batches let the Archive staff focus any books that needed more attention without having to sacrifice another book that also needed repairs. Pieces of unused newsprint were used to soak up the excess moisture, and were changed out regularly as the sheets absorbed water from the books. The books were also flipped from front to back and back to front every day. When the books were only damp, they were fanned out to dry, then placed in a book press to flatten the boards before they were completely dry. Determining when a book is dry is fairly simple, Holling explained. “If it feels cool to the touch, it’s probably still wet. At some point, it doesn’t feel that different from any regular book,” she said. Tower of London was among the last books to come out of the freezer. Holling says the reason for that is because they were not sure if any of the pages had been clay-coated. Clay-coated pages, if they get wet, stick together and it’s nearly impossible to pull them apart without tearing the pages. 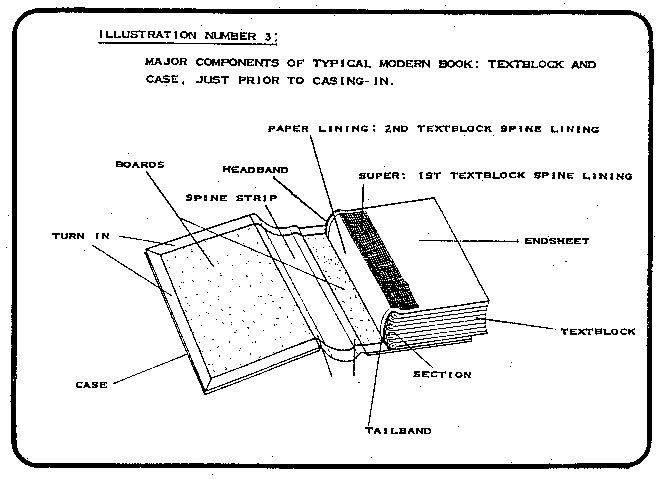 Holling likens it to a wet magazine – the pages bond into a brick and pulling them apart just tears the pages. At that point, it’s just trash and there is no salvaging it. While the Ainsworth book did not have clay-coated pages, it did have a number of illustrations. Fortunately, the pages were not standard wood pulp used in books today. Instead, the pages were made of cotton rags. That changed this copy of Tower of London’s fate. The paper made from cotton rags is nicer, lasts longer, stays whiter and cleaner, and the cotton does not degrade like standard paper pulp. Given its age and condition, the pages and binding have held up really well, Holling said. It even still had its headband and tailband still intact. 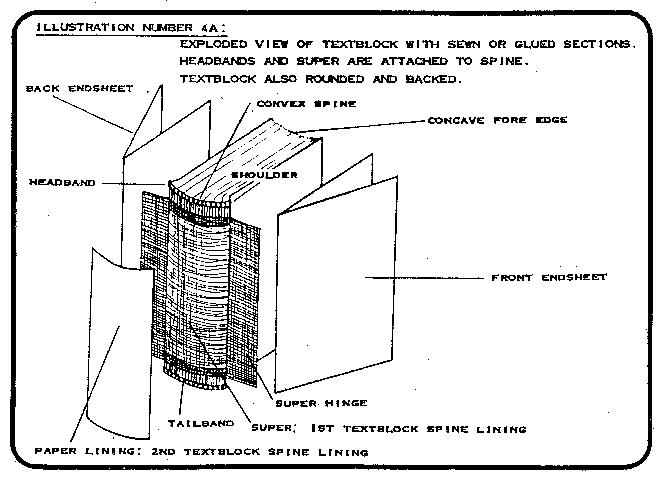 The cover tore along the fabric gap of the spine, where there’s less support. Holling says it probably ripped there because the book swells when it gets wet and stresses that edge. Also, that’s an area that commonly well-worn on books, and many repairs happen along the spine strip. In this case, that strip ripped and exposed the paper lining. When looking at the months of work that’s gone into saving Tower of London, it might seem like it’s one of the most valuable books in the Archive collection to get damaged last August, but that title (pun intended) probably goes to a first edition of Peter and Wendy by J. M. Barrie that was used a few years ago as the object of a fake "theft" during CCPL’s how-to-host-a-mystery-style "Sherlocked in the Library" program hosted by Young Adult Services, Reference, and the South Carolina Room and Charleston Archive. Still, Tower of London is not without an interesting story and a tie to a famous name in Charleston’s path. The book was marketed as an historical romance, and focused on the short life of Lady Jane Grey from her time as Queen of England to her execution. It was originally published in 1840 as a serial. And Edgar Allan Poe was not a fan of the book or Ainsworth’s writing in general, it seems. “The authorship of this work does a little, and but a little, more credit to Mr. Ainsworth than that of 'Jack Sheppard'. It is in no spirit cavilling that we say it is rarely our lot to review a work more utterly destitute of every ingredient requisite to a good romance," Poe wrote in a review of Tower. Jack Sheppard references another of Ainsworth’s novels, one that’s credited with popularizing the Newgate novel tradition of criminal biographies to emphasize their actions. Sheppard even ran in a monthly magazine alongside another work in that same tradition that almost everyone has at least heard of if not read: Charles Dickens’ Oliver Twist. Turning back to CCPL’s copy, it was published sometime in the 1870s by a publishing company in Philadelphia named T. B. Peterson and Bros. of Chestnut Street. It turns out Peterson and Bros. also published embroidery patterns, possibly indicating where the paper lining originated. Still, Holling says it could have also been in a pile of scraps they purchased and used for that purpose given the time of publication. And there happens to be another copy of the same book from the same publishers for sale. The spine is intact but fraying. Is it possible another piece of that flowery pattern lies just below the cover? If you’re looking for one more question about this book, try this one: Where did CCPL’s copy of Tower of London come from? Turns out that’s a bit of a mystery, too. Holling says it’s part of the historical children’s collection, which is a little odd given its length and subject. No, young children were not reading 386-page romance novels about Jane Grey in the 19th century. To start to answer the question of its origins takes another trip back in time to the days before CCPL existed. Before CCPL, Charleston’s museum had a small children’s book room, and when CCPL was founded there was no actual library building so the library operated out of that room of the museum. At the same time, storied librarian John Cotton Dana donated materials to the newly formed CCPL to help fill the shelves. Now the books that had been in that space are mostly stored in the Charleston Archive, and most of them have catalog cards on them thanks to some cataloging work in the 1970s. The call number for Tower of London is MUSEUM J. Holling has been digging through early correspondence between library leaders and museum leaders looking for clues. She’s found a letter asking for a list of materials being kept, but no record of exactly what books were being kept in the library. Holling says it makes sense that if materials owned by the museum and items owned by the library were being kept in the same space, they would have to find a way to differentiate to which collection a book belonged. Giving them a “MUSEUM” or “LIBRARY” call number would accomplish that. However, that’s far from definitive proof, and Holling says the goal is to spend some time at the museum digging through correspondence and inventory details there. It’s possible an answer is just sitting in a box waiting for someone to look at it. To learn more about the collection at the Charleston Archive and the South Carolina Room, click here, or watch the segment in our #MeetYourLibrary series.